The Professional Football Association (PFA) announced its Top XI on Thursday and it leaves me scratching my head. I decided I needed to break down the flaws in their Team of the Year and create my own. Vardy (above) and Mahrez have Leicester on the cusp of an unlikely title. Well first let’s start with what they got right. And most of it was right. Harry Kane lead the league in scoring so he is a no-brainer. Jamie Vardy has played out of his mind as well, scoring 22 goals and adding six assists. His running mate Riyad Mahrez has been a stud as well, finishing fifth in goals and tied third in assists. Deli Alli’s number are impressive with 10 goals and nine assists. David De Gea is the best keeper in the Premier League as United has allowed the second fewest goals in the EPL this season. De Gea only allowed 28 of them too. With Tottenham being the only team to allow fewer goals, Danny Rose and Toby Alderweireld are hard to argue with. Hector Bellerin has played deserving football as well to make this team. I can’t even argue with Wes Hoolahan, who has started and finished every game for Leicester this season. I could argue that Jose Fonte or Chris Smalling should have been included over him, but we will let that go. Aguero is tied with Vardy for the second most goals in the league. That leaves only a few that I would leave off, but they really bother me. First, I am not a huge fan of Payet’s inclusion. He failed to register double digit goals or assists this season. That might be nitpicking, but everyone else in midfield or attack on this list, except Kante, has hit double digits in at least one of those two categories. In 27 games, he registered 18 points, which is very respectable, but with some of the other options out there, I would have changed the formation. I think I would’ve picked a third striker in place of Payet in the form of Sergio Aguero. He played the same number of games this season, often through some sort of injury and registered 24 points compared to Payet’s 18. That kind of performance is deserving of the designation Top XI. Ozil has been the engine behind Arsenal’s attack. The other issue I have is N’Golo Kante. That’s not to say that he isn’t a great player and hasn’t had a great season. And yes, I know he lacks the counting stats because he is a defensive-minded player, but when you have someone like Mesut Ozil lead the league in assists, by a sizable margin as well with 18 compared to Christian Eriksen’s 12, you cannot leave him off of the team of the year. He also knocked in six goals of his own. Ozil is on the shortlist for player of the year, so it is mind boggling that he could be left off of the team of the year. If you want to argue with me that I cannot replace Payet with a striker then fine, but I would leave Kante on before I left Payet. His play defensively I think outweighs that of Payet offensively. Payet is making this mainly as an offensive playmaker, a role which Ozil has surpassed him in this season. I might even argue that Eriksen was more deserving of the spot than Payet was. The PFA did alright on the whole, but some of the snubs make it a very questionable lineup. Adding Ozil probably would’ve saved them from me writing this. I still can’t figure out how the guy who is on the shortlist for player of the year gets left off the team of the year. Oh well. Now we all just get to sit back and watch if Leicester can hold onto the title. Continuing from where we left off, this is what is topping each Premier team’s wishlist as they head into the January transfer window. To see Part 1, click here. If you want to maintain that you belong in the Premier League, then Paul Dummett cannot be your best option at left back. Massiado Haidara has mixed in with him as well but neither one is ready to be a starting full back in England. The Magpies have allowed the second most goals in the Premier League this season. Some of that can be attributed to the rash of injuries at keeper but the poor play at left back definitely does not help. In their return to the Premier League, Norwich has held their own, but if they plan to stay here they are going to need some attacking help. Youngster Nathaniel Redmond leads the team in scoring at the moment with only four goals. Cameron Jermone is the leading scoring forward with just three. Norwich needs to spend a little bit to bring in a quality goal scorer. In 11 out of 17 matches, Norwich has been held to one or fewer goals. That cannot continue if they want to start thinking about year 2 in the top division. To say that Southampton are reeling is a bit of understatement. This team finished just outside of a Euro League spot last year but find themselves in the bottom half this season with a lot of question marks. The departure of both Nathaniel Clyne and Morgan Schneiderlin over the summer has left this team starved of creativity and reliability. Infusing a player that can control the pace and create chances will give Southampton the boost they need back into the top half. Go ahead. Try to score against Stoke. It has been nearly impossible to net one against Mark Hughes side this year. That is a credit to the backline and the play of the rising star in Jack Butland Stoke have in between the pipes. Despite that, Stoke are midtable with the worst offense in the league. Scoring only 14 goals in 17 matches is a recipe for disaster. The lack of scoring options on the team is astounding. Stoke only have four players to score for them this season, and they are all strikers. Hughes needs to have someone from the midfield who can pose a threat as a goal scorer to push this team higher up the table. Sunderland are in danger of relegation. They sit just five points behind Newcastle and Norwich, who are just above the relegation zone, but the Black Cats are going to need some major defensive overhaul to stay up this year. Sunderland has allowed the most goals by any Premier League side this season, almost two per game. John O’Shea is on his last leg and Billy Jones commits a lot of fouls. This team needs to find some new blood to reinvigorate one of the worst backlines in European top division football. To say Swansea need some more scoring options is an understatement. Andre Ayew and Bafetimbi Gomis have accounted for 11 of Swansea’s 15 Premier League goals this season. As a result, Garry Monk is gone and Swansea is in free fall. Finding a reliable goal scoring option to supplement Ayew and Gomis would stop the bleeding and put Swansea back on track for staying in the Premier League. Spurs reach the halfway point in a Champions League spot with a healthy goal difference. Spurs have only lost twice the whole season but have drawn a league high eight times. If Tottenham want to make a push for the top then they are going to need to control the game a bit more to avoid giving up late goals. They have a tendency of blowing late leads. Finding a midfielder who can hold possession and run with the ball late in games could prove to be the difference maker between Tottenham being good and great. You might even be able to add Etienne Capoue and Nathan Ake to that list. They have been the core that has led Watford to a Europa League spot in their first season back in the top division. To say Watford has been impressive is an understatement. Deeney and Igahlo have been at the center of that. Deeney has scored five goals while setting up four goals. Igahlo has scored a whopping 12 goals and even chipped in two assists. Watford could easily finish in the top half if they can keep their key pieces in place. I doubt they will care where the goals come from but West Brom needs to score more. So far this year, they are averaging a goal per match and the teams leading scorers only have three goals to their names. Saido Berahino hasn’t helped the situation much with his refusal to play at times, especially when you consider that he is one of those players for West Brom to have scored three goals even though he only has eight starts to his name. He played a lot last season but this year, Valencia has failed to work his way into the first team. He has been subbed on four times this season and has failed to make any sort of impact after joining the fray. He notably said that the club had forgotten about him. It is pretty clear that he is not fitting in and he has only scored four goals in his now year and half with the club. If West Ham could find a taker in the vicinity of the £12 million they paid for him last summer, the Hammers could look to improve the midfield and invest in a young defender or two to ensure future success. I’m back! Did you miss me? Did you even notice I was gone? Well just pretend you did and get ready for the Aftermath to resume its normal production of content. This time of year, millions of kids across the globe are finalizing their Christmas wish lists. With the holiday and subsequently January quickly approaching, The Aftermath is creating a wish list for every Premier League team as the January transfer window gets set to open on New Year’s Day. To see Part 2, click here. The Gunners were my preseason pick to win the title and they are still right in the thick of the title chase. To make that final push, they need to find a second set up man in the midfield. Mesut Ozil has been incredible this year, setting up 15 goals, the best mark in the league by a significant margin. After that, there is a major drop off to Santi Carzola, who only has three assists on the year. Finding a second reliable set up man for when Ozil needs a rest should be the top of their to do list in January. Through the first half of the season, Villa find themselves in the Premier League basement, 10 points away from clearing the relegation zone. Villa might decide to pack it in and get ready for the drop or they might make a push to climb out of the cellar. Assuming they will go for the latter, Aston Villa needs to find a new striker. They have plenty of players that can swing the ball into the middle and give them chances to score but now they need someone who can finish those headers. Rudy Gestede fits that role perfectly but with only three goals in 17 appearances, it looks like they need to find someone who is more reliable. The Cherries have had a strong start to the season given that it is their first year in England’s top division. They have a number of areas where they could improve but the most glaring one comes at the back end. Bournemouth have used two keepers so far this season in Artur Boruc and Adam Federici. Federici has been far from relaible, allowing 12 goals in just 5 games. Bournemouth need to find a true first team keeper and push Boruc into a rotation role if they want to stay in the Premier League. Raise your hand if you predicted that through 17 games, Chelsea would only be three points clear of relegation. Put your hands down. The Blues are off to their worst start in the last decade and just fired Jose Mourinho. This is a time of change at the club and it should continue with the addition of a new forward. Diego Costa is the leading scorer at Stamford Bridge with just three goals to his name. Falcao once again failed to take hold, Pedro has not had much of an impact yet and Loic Remy has been relegated to a substitute role. Adding a top notch goal scorer, who can create his own chances and work the keeper from outside the box has to be high on Chelsea’s want list. Crystal Palace has already shown they can find good deals in the transfer market after signing Yohan Cabaye for a good price. Cabaye has performed very well and leads the team in scoring. The only thing separating Palace from Champions League football right now is goal difference. If I am Alan Pardew, I want to find a young defender that can learn this year, serving more in a rotation role and develop into a major contributor by the next. The average age of Palace’s back line, is 29 years old. Infusing some youth might not be a bad idea. It is hard to tell where exactly Everton need help. They have played well offensively. Defensively, they have been solid, yet they sit middle of the table. Looking at this team, Everton would do well signing a defensive midfielder. It would give Roberto Martinez another option alongside Gareth Barry and Tom Cleverley. The defensive has room for improvement as well and with plenty of attacking option already in place, bringing in a defensive-minded player should be the next move. This sounds kind of lame but with so many rumors linking Jamie Vardy and Riyad Mahrez away from the club, that will be the key to Leicester succeeding. There are some concerns at the back end but with offers bound to come pouring in once the calendar hits January, hanging on to the two star attackers will be the best thing Leicester can wish for. Getting rid of Brendan Rodgers hasn’t helped anything so far. Liverpool needs more than a new manager to fix their shortcomings. Starting that repair process will be centered on finding a wide midfielder. It might seem like a slap in the face but having an attacking winger like Raheem Sterling would likely be a huge boost for the Reds right now, who have struggled to consistently create offense all year. Out of their 17 matches this year, Liverpool have been held to one goal or fewer 12 times. It is hard to say that City needs a whole lot of improvement heading into the second half but they are six points back of the table leaders by six points. City has been great at scoring this season, but they have hurt whenever Sergio Aguero cannot go. Wilfred Bony has been solid but not consistent enough. Adding another goal scorer to take some spot starts and keep Aguero healthy down the stretch could be the difference for City in their title chase. The defense for United has been impeccable. They have allowed only 14 goals in 17 games, tied for the second best average in the Premier League. However, the scoring from the Red Devils looks average this season. Juan Mata and Anthony Martial lead the team with four goals apiece. Meanwhile, Wayne Rooney is starting to show his age. Adding another player who can man the attacking spot alone up top is imperative for United. What on Earth has happened to Chelsea? The 2015 Premier League champions have not looked like they will be defending their title much less even qualifying for European football. For a team that was so heavily favored to repeat as league champions, the results that Chelsea has amassed are mind boggling. Forget challenging for a title. Chelsea is only four points clear of relegation. Mourinho has struggled to repeat last year’s stellar performance at Stamford Bridge. The issue begins at the top with manager Jose Mourinho. He is very abrasive by nature and tends to make a lot of enemies. Right now Chelsea has a target this size of London on its back and it continues to grow with each week that Mourinho spends criticizing opposing managers, referees and players alike. Mourinho might not like it, but the best thing to do is to take a step back and lessen the pressure on his team. Chelsea needs to get back on track in the worst way, but as long Mourinho continues to antagonize the rest of the league, they will all continue to gun for them. That kind of conduct is starting to cost the team as well. Mourinho was suspended today for his most recent outburst against West Ham. Playing a game without your manager makes it increasingly difficult to win. Chelsea need to find a way to win as well. They have failed to emerge victorious in their last four matches, which included three loses. The Blues were bounced from the League Cup, failed to secure points in two league matches and could not beat a Ukrainian side in European play. That kind of slide is nothing short of historic for Chelsea. Since the Premier League was created back in 1992, Chelsea has never has as poor a start as the one they are enduring now. Hazard has appeared in 16 matches so far for Chelsea this year and failed to score a goal. Part of that directly ties back to Mourinho. He has been very successful at alienating his best player in Eden Hazard. Hazard might have gotten a little complacent after receiving the Player of the Year award last year in the Premier League, but the talent is still there. Now, there are rumors circulating that Hazard is as good as gone in the January transfer window because he just cannot stand it stay. Hazard has gone as far as to say that he will push through a move to Real Madrid in January. It is clear that the Belgian international wants nothing to do with his abrasive boss. Hazard is far from the only one unsettled by Mourinho’s tactics. The Daily Mail reported that one player in the Chelsea locker room said he would rather lose than win for Mourinho. If that is the response that you are getting from players, then a change must be made. That change should not be assumed to sack Mourinho. With matches against Stoke, Norwich and Bournemouth on the coming slate for three out of Chelsea next four, the team could get back on track. However, if Chelsea fails to push back into the conversation for at least a top four finish by then, Mourinho must go. Mourinho is running out of opportunities to turn Chelsea around. Giving him this little window to make up for his mistakes is crucial for the team going forward. It seems that most players have lost faith in their manager but getting back on track could revive this team heading into the January transfer window. Some of those whom Chelsea decides cannot work with Mourinho can be moved and Mourinho will have the opportunity to bring in some players of his choosing for the first time at Stamford Bridge. This season is not lost for Chelsea. Making a title challenge is overly ambitious, being 14 points down right now but pushing back into at least a Europa League position is more than manageable. Chelsea fans won’t be satisfied with settling for fourth or fifth but that might be the best the Blues can do after such a disastrous beginning. Mourinho needs to learn now from what this first quarter of the season has taught him. He cannot do whatever he wants, whenever he wants to. He must play by the rules and realize that there is more to being a manager than just the tactics. Motivating a team to give its best effort is part of the process and it seems like Mourinho is not used to having to do that. That does not mean he should be excused from making it happen. Chelsea is most certainly in trouble. Mourinho has the ability to save his job and their season or forfeit both in the next month. October 2, 2015 October 2, 2015 Chris McGlynn EPL, FIFA, Football, MLS, NFL, Soccer	Roger Goodell, Sepp Blatter, Who is worse? Don’t you just hate when people lie to you? Or when people just don’t understand when they have done something wrong? Or when it seems like everything someone does has an ulterior motive that seems to somehow benefit them? Any of those descriptions could apply to Sepp Blatter or Roger Goodell. Both men run probably the two most powerful sporting organizations in the world. Honestly, two of the most powerful organizations of any kind. According to bloomberg.com, the NFL generates an estimated $9.5 billion per season with a market value of roughly $46 billion between the 32 teams. FIFA generated about $5.7 billion in 2014, according its end-of-year financial report. $4.8 billion came from the World Cup in Brazil, and only about $2.2 billion in expenses. Clearly, both of these organizations are very lucrative. Then you realize that both of them are registered as non-profit organizations. Yup, that’s right. No taxes for either the NFL or FIFA league offices. Well, the NFL actually recently changed its stance on that. It decided to give up its tax-free ways so it could now hide Goodell’s salary. Go figure they want to be as opaque as possible. That is definitely frustrating, as a tax-paying citizen, to hear. If that proves to be too much anger for you, stop reading this now, because it gets a whole lot worse. Debating who is worse of these two clowns is sort of like debating which is worse, Comcast or Time Warner Cable. They both are awful, money-sucking entities with an inability to apply reason to situations that need to be fixed, but somehow, one has to be worse than the other right? 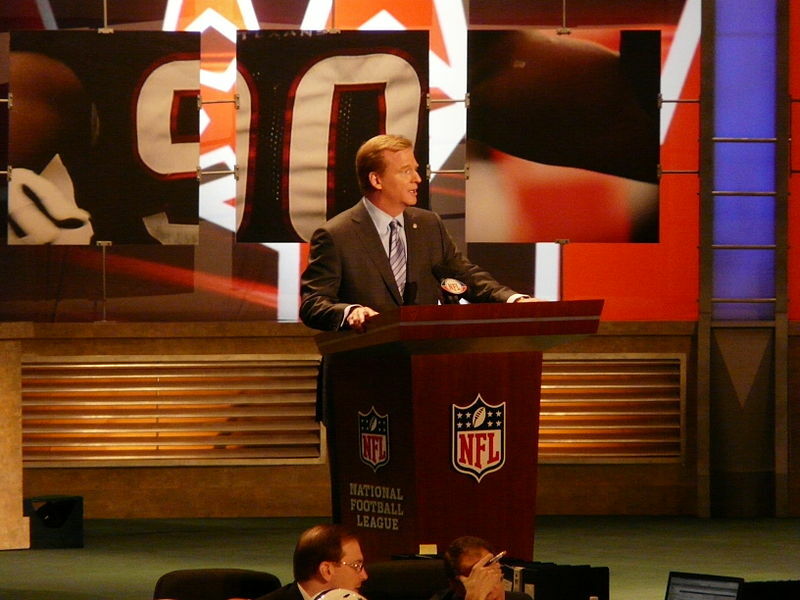 Goodell has been commissioner of the NFL since 2009. So, we’ve talked about the organizations completely dodging taxes, which is beyond ridiculous. The amount these two men make though is even more absurd. Goodell makes way more than any of his top players make in a given year. His salary was $45 million in 2012 and it took a drop to $34 million in 2013. However, he does not have to worry about his pay for a while. The New York Daily News reports that Goodell received a package that will pay him roughly $300 million over a seven year span starting in 2012. That average of close to $43 million a year is about double what the league’s top players make every year and they risk their bodies for our entertainment. Goodell sits in a cushy chair and just suspends whoever he likes (more on that later). Blatter is not quite as bad as Goodell in terms of his greed for his salary. Different sources conflict on how much Blatter makes. One thinks Blatter makes roughly $1 million annually. Another pegs it somewhere between $5 and $18 million. FIFA does not have to release it’s executives salaries each year. However, the likelihood is that Blatter makes more than just his salary, it just isn’t listed. FIFA also has a track record for ripping off host countries. Blatter and his organization are exempt from all taxes, local, state and national, when operating in the country for the World Cup. In fact, Brazil estimated $248.7 million in lost revenue following the World Cup just for letting FIFA evade taxes. More often than not, FIFA causes countries to shell out an inordinate amount of money and then actually walk away worse off financially than when FIFA arrived. The funny thing is, that isn’t even close to the worst part about FIFA. Over the past year or so, FIFA has been rocked by allegations of bribery and corruption. 2015 saw the story break regarding a scheme that FIFA officials organized to generate more than $150 million in kickbacks for themselves. Now Blatter was not one of the officials named in this situation but this is not the first time FIFA has been accused of corruption or accepting bribes. Dating back to 2010, FIFA executives have served bans for violations of ethics codes. With all of this going on in FIFA it is hard to believe that Blatter has not been a part of some of the activity, taking his fair share of bribes. While he wasn’t named then, things finally seem to have caught up to Blatter. 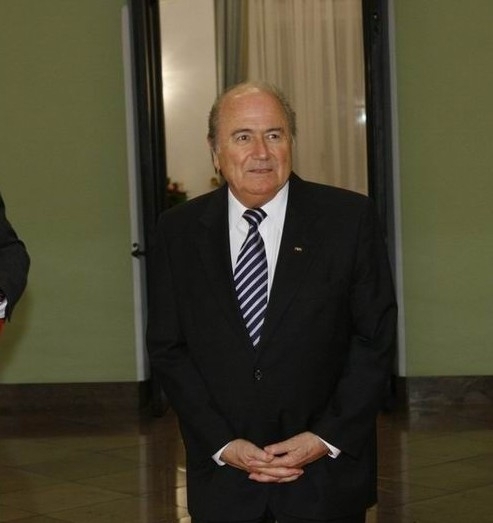 The Swiss Attorney General’s office announced it was launching an investigation “on suspicion of criminal mismanagement…and – alternatively – misappropriation.” The report also mentions that Blatter’s office was searched and data was seized. Goodell has never been accused of criminal activity, which would definitely go in the win column for him. However, he has grossly mishandled several legal cases with serious repercussions. For starters, there was Goodell handing Ray Rice only a two-game suspension after he had weeks to review the situation and give an appropriate punishment. Rice punched his then fiancee in the face, knocking her out, then dragged her onto an elevator. The NFL received word of this and then rather than rationally seek outside counsel for a case they were not equipped to handle, brought Rice and his fiancee into the same room together to rehash the situation. That is a principle violation of how to handle assault cases mainly because the accuser is in the same room as the assaulter. More often than not, the accuser will stand down out of fear that if he or she tells the truth, the assaulter will hurt them again. So there was that. Then there was Goodell mishandling Ray McDonald’s, Adrian Peterson’s and Greg Hardy’s cases as well. Needless to say, Goodell had a rough 2014 offseason. But then his popularity rating dropped even lower when he picked a fight with Tom Brady and slandered his name despite having no hard evidence. 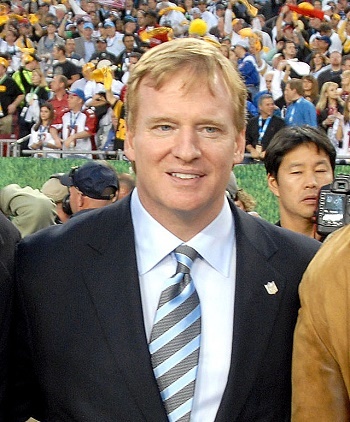 Many people agreed with Goodell’s thinking that Brady was innocent but Goodell once again displayed his dictator-like powers, handing down a four-game suspension (keep in mind he suspended Rice for only two for punching his wife) to Brady on the account that Brady might have been generally aware that someone had tampered with the footballs in the AFC Championship game. Even now after a federal judge ruled the suspension unfair, the NFL continues to drag out the fight, looking to appeal the ruling on the appeal (which is also just stupid that it is allowed). Right now, these two men are at an all-time low in terms of popularity. However, Goodell might have the slight edge. No NFL sponsors have publicly demanded for Goodell to step down from his post, (although, they probably should have). Meanwhile, Coca-cola just released a statement that Blatter must step down amidst the corruption scandal. It is a long time coming but Coke finally pulled the trigger. 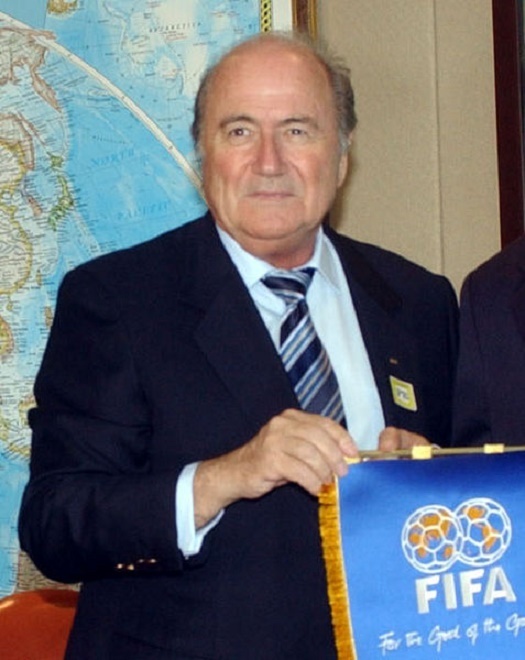 No word has come yet from Blatter on what he will do now that this is out in the open. So while Goodell is an inconsiderate, greedy, sexist and overall incompetent man, he managed to make the NFL lucrative with having to break dozens of laws and fund himself with illegal hidden payments. Blatter has corruption written all over his organization during his tenure, from accepting bribes for World Cup allocations to illegal contracts. Thankfully, it seems like Blatter is on his way soon between he “resignation” that should hopefully take place in December and a major sponsor turning up the heat. Now if only Nike could finally tell Goodell that he really just needs to take a hike, the world be a much better place.